P.S. 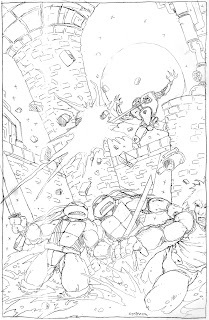 -- Looking at the printed cover on the ninjaturtles.com website, it kind of looks like my Photoshop coloring, but I'm not completely sure. Leo!!!! Woo! Jump up there and slice that suckka! I think what amazes me the most is that you still have a LOT of stuff from back in the day-- AND you can find it! I would have thought a lot of it would have been lost, tossed, sold, given away, or simply damaged by time. -->> The pencils show this cover in a whole new light. Never seen it before like this. Daniel should see this !! Thank goodness for you being a pack rat. I never get tired of looking at this stuff.